This list, chock-full of helpful information on maintaining one's pet Godzilla, has shown up in various places on the Web. Invariably, however, it eventually disappears from a given location. So, I decided to create my own 99% plagiarized version of the page (slightly updated to reflect the events in "Godzilla vs. Destroyer"). That said, as it had to be, let's see what we can do about prolonging your pet's lifespan, most of which will involve prolonging yours. 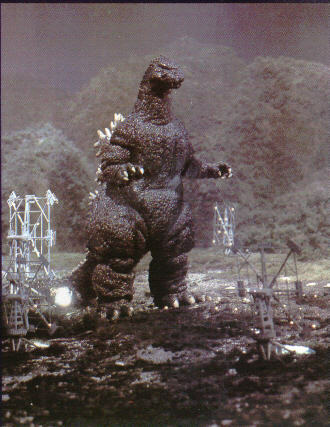 Until recently, Godzillae have been found exclusively on Monster Island and the main islands of Japan. Of late, however, there have been accounts of the hulking behemoths in the United States, chiefly in the area of movie theaters and a number of back alleys in Philadelphia. What's important to you is to duplicate your pet's natural surroundings as closely as possible. In the United States, of late, this has become easier due to huge numbers of Japanese imports into the bloated U.S. Consumer market. Your pet should feel right at home, and any large, coastal city with large ships and elevated trains near the ocean will be suitable for your pet's rest and recreation. You should be aware that your pet will go through 2-3 tankers in the course of each month, and as many elevated trains as he encounters. Arrangements with the Liberian government and your local transportation authority may be advisable. You should always provide a hide box in your pet's habitat. This will be for you. We recommend a converted, hardened Titan missile silo or a mine shaft not less than 350' from the surface in rock no softer than igneous basalt. Don't forget to install a filtering system to remove the lethal Strontium 90 deposited by your pet's breath. You will spend a lot of time in your hide box. This is normal and very, very, healthy. 1. A huge glowing egg somewhere in the immediate vicinity -- be very careful not to mistake such for one of those vinyl-roofed tennis rinks, or very much vice-versa. 2. Two huge giant caterpillars roaming through the subway tunnels. Once again, proper identification of exactly what just pulled up at the transit stop may be in order. 3. A sonic boom followed by the stuff of Lepidopterists' nightmares, the huge winged insect's presence usually predicted/followed by the presence of identical singing twins of 7-8" in height and the typical cynical, relentless, Hollywood/Ginza promoter. 4. Finding your pet wrapped in miles and miles of sticky, dental-floss-like material, so that he is unable to move. In case of the last, pop the champagne and leave the country. DON'T trust the Japanese Defense Forces to keep your pet under control. The Navy and the USAF continue to react badly to the appearance of Mitsubishi Zero-Sen aircraft over American sites, and there's no point in starting up all that again, is there? Moreover, spectacular as those weird- looking satellite dish-things are on film, it is difficult to dub in the animated laser beams they shoot in real life. A final note: Japanese Defense Force activity in other parts of the world may cause all of Asia to panic. U.S. military activity in any part of the world may cause the entire world to panic, particularly in parts of Washington, D.C., Europe, and the Middle East. DON'T attempt to help your pet when shedding. The removal of even one fleck of skin from his vast outer hide will undoubtedly expose you to over eighteen times the NRC maximum annual roentgen level for high-level atomic plant workers. Mist him down (using either slurry planes or a convenient fireboat) from a distance. If you think your pet is grouchy enough most of the time, his first shed will be a major learning experience for you. DON'T operate a computer anywhere in the vicinity of your pet's habitat (current Godzilla owners reading this are already in big trouble). Like many members of his family, your pet will immediately appropriate your video display for basking sessions (See FAQ on Monitor Lizards, and, in Georgia, Savannah Monitor Lizards). DON'T attempt to control your pet's behavior with the use of tactical or strategic nuclear weapons. Despite the first rate- opportunities for urban redevelopment and national guilt they offer, exposure to even the tiniest amounts of U-238 and Tritium are likely to make your pet return to a feral state. They sure as blazes won't hurt him. DO take your pet to a showing of Jurassic Park, since he gets few enough chances to laugh out loud as it is, and since he will undoubtedly put the audience on their best behavior. A white-hot jet of glowing radioactive plasma is the cure for even the most determined cinema talker. DO allow your pet to mix with the rest of your pet collection. Dogs and inquisitive cats will develop an entirely new attitude toward your herptiles as a consequence, and even the most crotchety of iguanas or burmese pythons will develop an entirely revised sense of self-esteem if they survive the aftermath. DON'T attempt to control your pet's behavior with an oxygen destroyer. Although initially effective, your pet will have an annoying tendency to reappear even after being entirely skeletonized by such an agent, and, obliging Japanese chemists of late have become increasingly unwilling to immolate themselves because of your careless use of nuclear weaponry. You will not only have your pet back again, you will have him back with an ATTITUDE. [NOTE: Plus, the oxygen destroyer may merge with and mutate local microorganisms and create a super "Destroyer"-type creature, and then you'll have two oversized pets on you hands, not to mention the rest of your body, your house, the entire metropolitan area ...]. You will have very little to say about when, where, how, or with whom your pet breeds--recall the saying about the sleeping habits of a 500 pound gorilla. You will be able to determine whether or not your Godzilla has bred by a certain smug and relaxed expression on his usually-dour features, and perhaps the presence of one or more cigarette butts among his substrate. In Japan, immature Godzillae are called Meen-Yas, in the United States, Barneys. Both types are noted for their inability to blow forth clouds of white-hot plasma, and a certain perverse desire to spend a great deal of time with small children. It is best to discourage this tendency on both sides as your newest problem matures. Generals in the presence of a Godzilla tend to scream wildly for the heaviest available firepower--but not for long. You can prevent avitaminosi s in your pet by exploding several low-level dirty nuclear air bursts in his immediate vicinity, but in fact, the general behavior noted above should provide that for you. Your pet is apt to be on his worst behavior in the presence of a Japanese fishing vessel, but the perennial bad luck of Japanese fishing vessels in the presence of atmospheric radioactivity means that there is really very little you can do about it. Besides, if you object to current Japanese whale and dolphin slaughters, it is possible to take a certain kind of unholy joy in exactly what is going to happen. As your pet ages, you may notice changes in behavior. At his youngest, he is at his most irritable and grouchy, and even as a mature leviathan he may fly into an extremely destructive rage at the sight of a Perry Mason re-run or movie on television. As he mellows, you may find him wrestling playfully with King Kongs, Ghidrah the three headed monster, Rodans, Mecha-Godzillae, cockroach-aliens, or other sea monsters. He may even begin marginally socially-acceptable behavior, such as saving the world from the clutches of the Smog Monster or Megalon. Recent studies, however, show a return toward grouchy behavior as time progresses--much as appears to be the case with the Japanese. And she lived in the ocean off Japaaaaaaaaaaaaaan..."